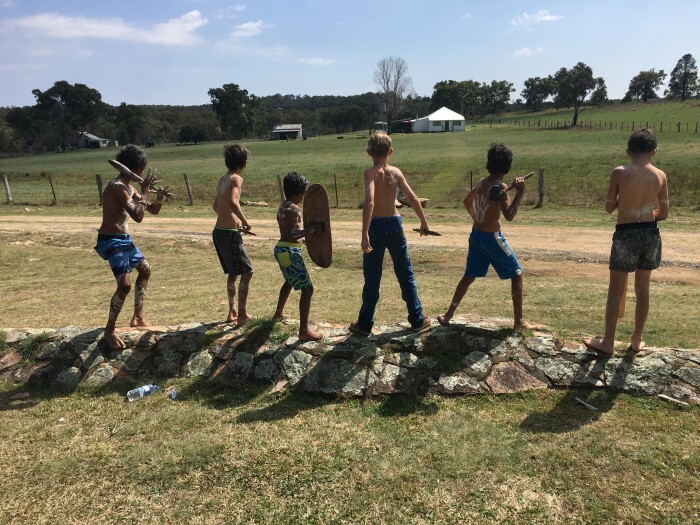 Thirty-three Aboriginal kids from the Northern, Western, Hunter New England and Sydney Districts of New South Wales immersed themselves in traditional art and customs at the inaugural Pathfinders Cultural Camp. Not-for-profit and Out-of-Home Care (OoHC) provider, Pathfinders, created the culture camp to address the loss of transmission of cultural knowledge from generation to generation for Aboriginal children and young people in care. From cooking kangaroo stew and damper to participating in separate women’s and men’s business, the kids spent their last week of school holidays at The Willows in Glen Innes, Indigenous protected land, reviving traditions and engaging in their Aboriginal culture. The kids who attended ranged from 8 years to 16 years old and came from a mix of foster care and residential care backgrounds. Five sets of siblings and families reunited and enjoyed the engaging activities with each other as well as with Pathfinders’ staff and Elders. Conversations during the “Who’s your mob?” activity and during country, language and totem discussions resulted in some of the children realising they had relatives at the camp they hadn’t met before. A teenage girl who attended the camp said she enjoyed spending time with family members while learning more about her culture. As a group, everyone participated in the opening smoking ceremony where they painted with ochre; they listened to stories from the Elders and actively participated in the bush walk and site appreciation; they examined Aboriginal artefacts and were shown how to make coolamons. In addition to culturally based activities, the children participated in swimming, kayaking, football and telling stories around the camp fire. Sally McLennan, Senior Manager of Out-of-Home Care, said there were special moments throughout the camp that showed the true power of the culturally based conversations and activities. “The girls yarned for two hours in a women’s circle with adults and Elders, and there were children who opened up and disclosed their experiences as a result of that safe space and discussion,” she said. McLennan said their next step is to go back to the kids for feedback to inform on how to run the next Pathfinders Cultural Camp, which they’re hoping to launch in the near future.